We went to Tate St Ives and the St Ives Food and Drink Festival 2018. We wanted to experience the scenic branch line on the St Erth to St Ives train, which sweeps along the coast, past the beaches of Hayle and Carbis Bay before arriving in St Ives. We coincided our visit to attend the unique St Ives Food & Drink Festival held on Porthminster beach and whilst making the journey, the Tate has always been on our bucket list for curiosity’s sake. We expected the train journey to be amazing as it features in many “must do lists”. The whole journey to St Ives was easy and trouble-free. 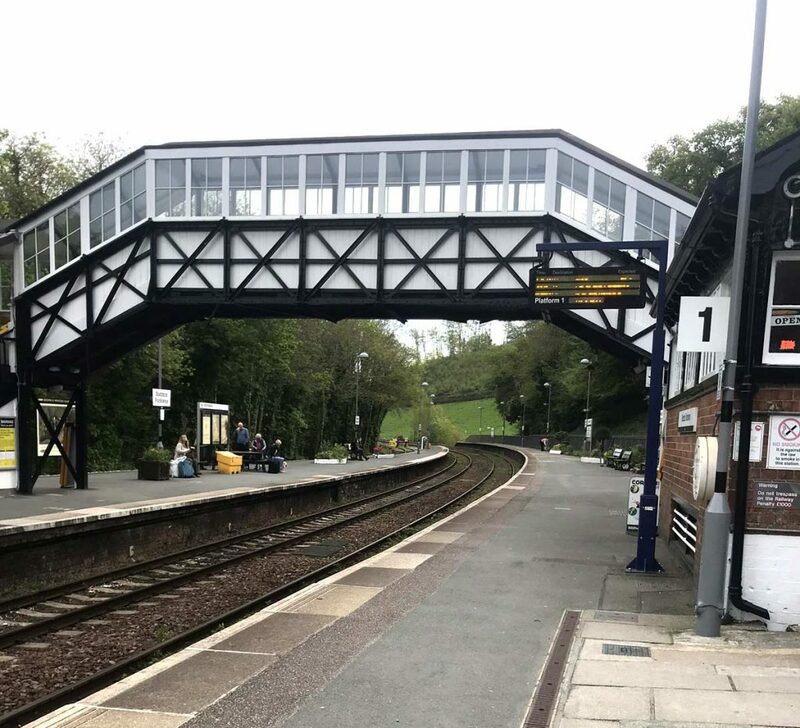 Emma got on at Bodmin and Alison got on at St Austell, we traveled direct to St Erth where we got off the train, walked to the next platform and our link train was ready and waiting for us to take us onto St Ives. We liked walking around the maze of streets in St Ives with many little gift and unique shops. It does have a few high street brands such as Cath Kidston, Weird Fish and Heavenly Feet but plenty of independent ones too. 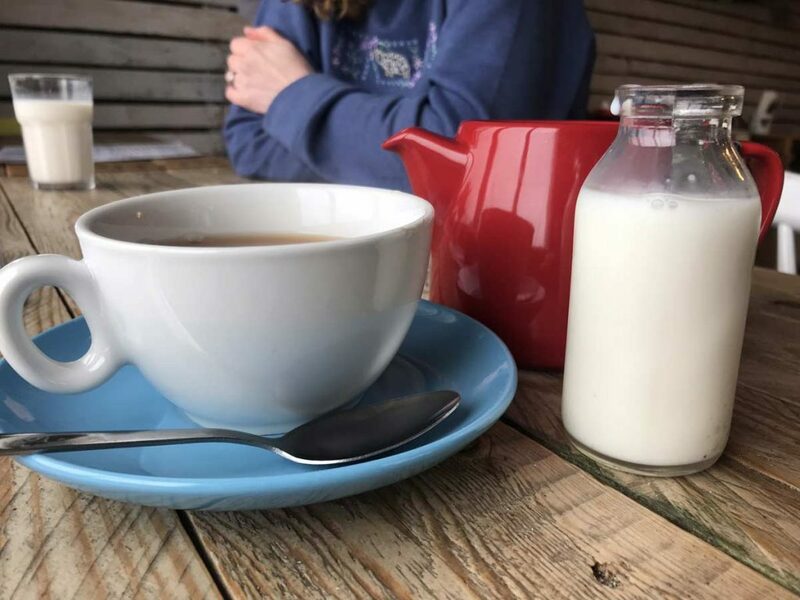 In town, we stumbled across a lovely café up some steps in the heart of St Ives called the Surf Shack Café; the owner and staff were all extremely friendly. 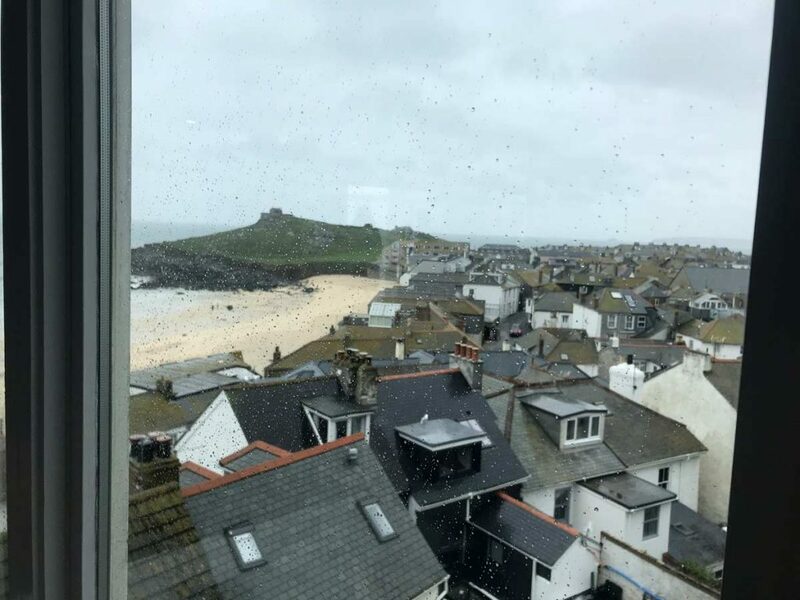 We talked to them about the reason for our visit to St Ives and they had nothing but good things to say about the festival so we are disappointed that we visited on a wet day this year. The café had a great selection of lunch options with the sort of food we wanted e.g. paninis, sandwiches etc., leaving room for a cake and some fudge later! Alison tried a savoury crepe with ham and cheese. As it was all cooked fresh you could add or take out anything and the staff were great hosts. The position they have is perfect so on a good day the view over the harbour will be amazing. St Ives lends itself perfectly to a circular walking route. It is a very easy stroll from the train station into the town; we then walked the scenic route around the coastline and harbour to the Tate adjacent to Porthmeor beach. Having explored the gallery, we then walked back inland through the warren of alleyways exploring all the shops which took us back to the train side of the town. But beware, there is an abundance of sweet and savoury treats to tempt you in nearly every shop window and you can’t possibly go home without purchasing some local products. We didn’t really know much about St Ives Food & Drink Festival although we wanted to explore and had heard good things. 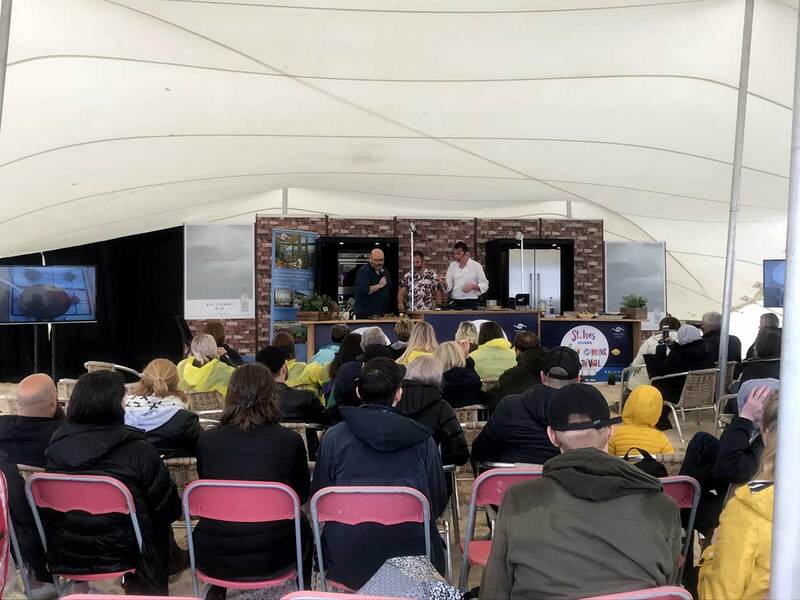 As the name suggests, the food and drink festival tries to cater for everyone with food and drink stalls from all over the world. It had cookery demonstrations from local as well as national chefs; we watched a demo by Stephane Delourme. There was a stage with live music as well as evening music sessions. There was also a kid’s fun zone where there was a bouncy castle although it was not open due to the rain. There were also two tents that they described as an artisan market. We’re already thinking we might go back next year at the same time to see how great the festival can be with the right weather. We didn’t eat at the festival as the seating was on the very damp sand. We headed into town to explore instead. An important note for future visitors: being on a beach it is not wheelchair friendly and no dogs are permitted. The weather wasn’t great but it didn’t dampen our smiles. 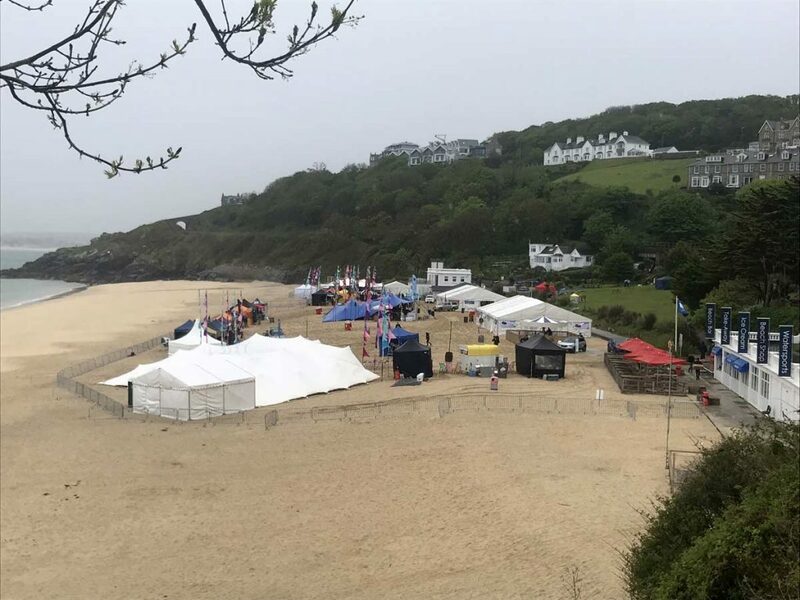 It turned out to be a very wet day, which wasn’t ideal for an outdoor festival held on the beach. Despite this all the staff at the festival were happy and full of energy as were the train staff and the shop staff who were all very welcoming. We also visited the Tate Gallery and thought the admission would be expensive for the day. However, we were surprised it was only £9.50 for an adult and free for under 18s. Very reasonable for the amount of art and culture that there is at the Tate and again such a must-see in St Ives. The building alone is iconic overlooking the ocean and the refreshments were more our cup of tea! 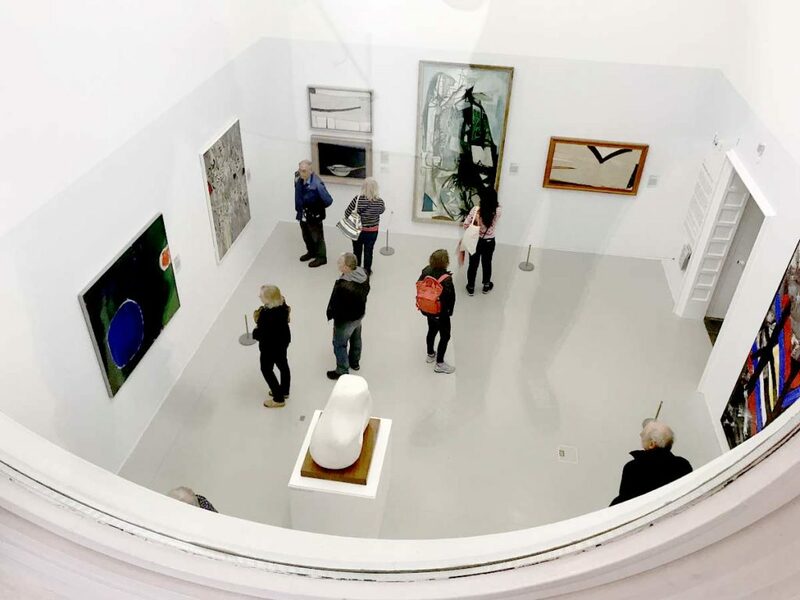 Or buy an Art Pass; enjoy seven days unlimited access to Tate St Ives, the Barbara Hepworth Museum, the Leach Pottery, Penlee House Gallery and Museum, Newlyn Art Gallery and The Exchange. About the author: Ali and Emma both work in Cornish Traditional Cottages’ property department and visited the St Ives in May 2018. Click to read about the other destinations and attractions Ali and Emma have visited.